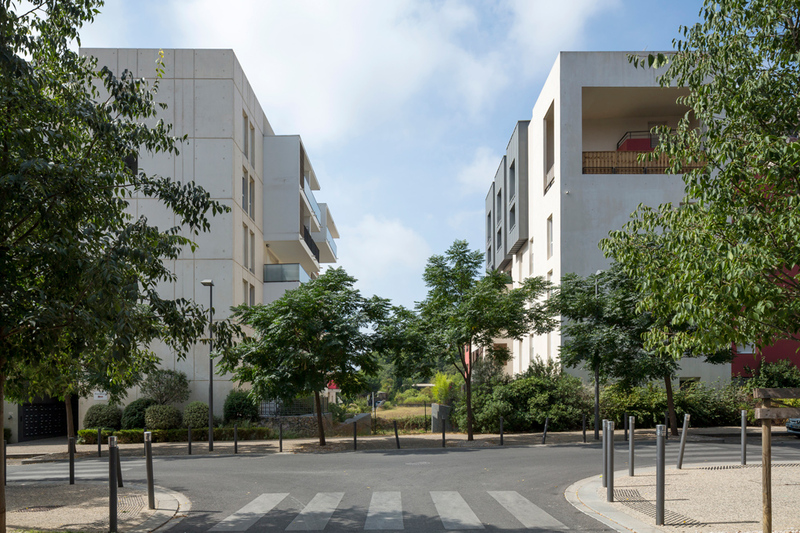 This new 3000 housing units neighbourhood is located South West of Montpellier close to the city’s limit, bordering the surrounding countryside. Ovalie is first and foremost a small community scale neighbourhood that we want to offer to its residents so that they consider it their own and take good care of it. The best testimony to a successful urban design for a neighbourhood lies in its inhabitants feeling at home. In Ovalie, the variety of residential options – townhouses, single family homes, condominium buildings – allow everyone to live in harmony according to their own aspirations. Our design is based on the respect of the spirit of the place and enhances the site qualities, the sceneries, the land features. 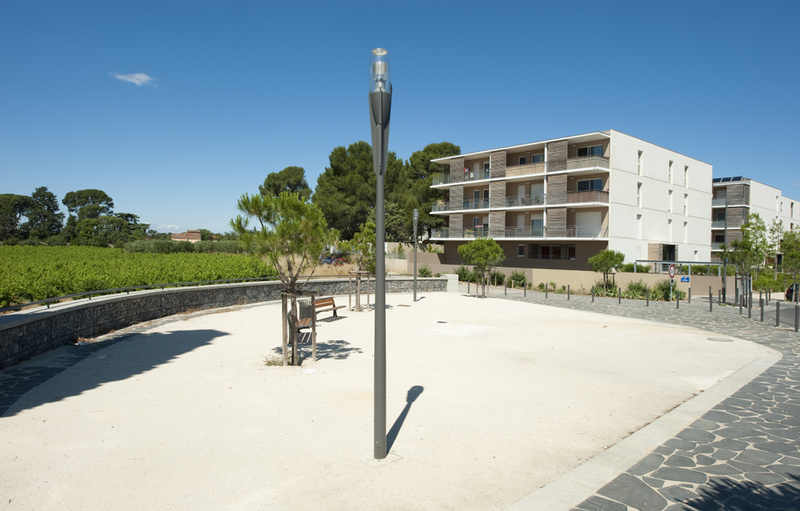 It also ensures a smooth transition from the new district to the nearby old vineyard estates, Chateau Bon and Mas Nouguier, integrating the new neighbourhood within the surrounding countryside. 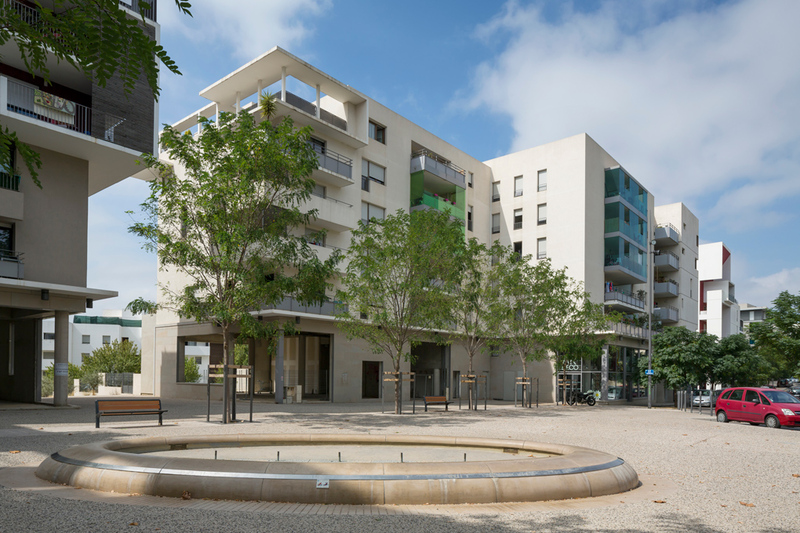 The housing blocks are richly landscaped and open towards the outside in order to bring out the variety of atmospheres, sceneries and public spaces. The blocks are limited in size and the housing units themselves are of different size and type. 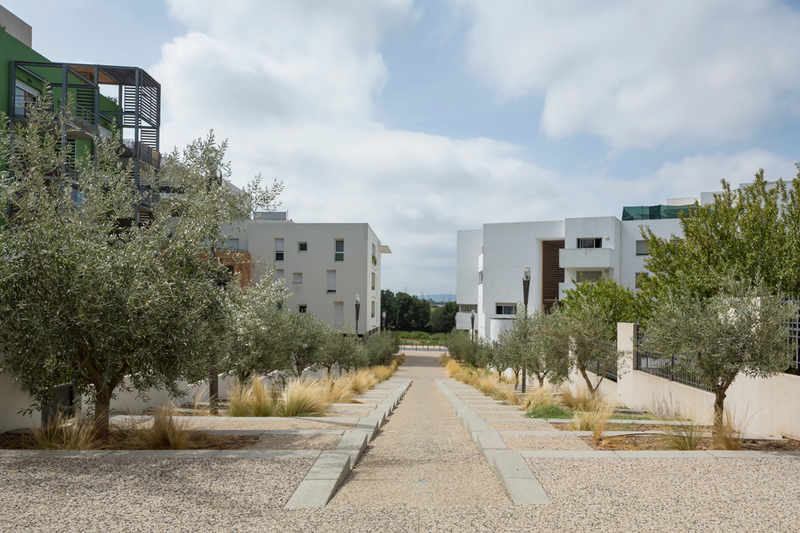 As a result, Ovalie stands as a neighbourhood rich in values, preserving and integrating the few pre-existing older buildings and the natural environment. 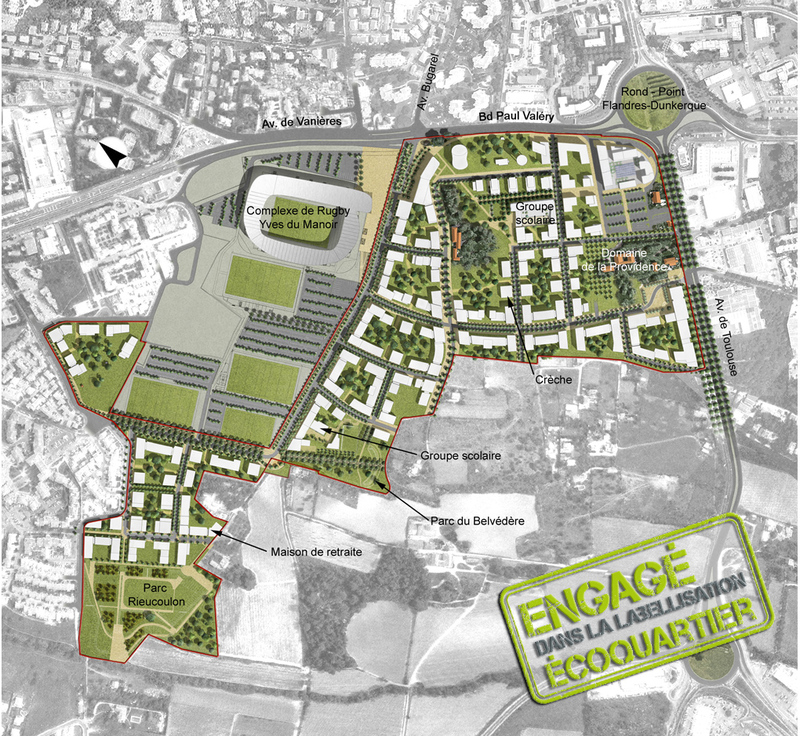 The evolving design features a mix of housing, commercial spaces, professional offices as well as educational facilities such as a school and a child care centre, sports facilities (Yves du Manoir rugby stadium), a nursing home, thus ensuring the neighbourhood with a perennial urban structure. The architectural compositional devices consist of simple volumes free from ornaments and solid, long-lasting, quality materials so as to appear with utmost clarity. Each block’s corner is treated in a distinctive manner and each building’s design emphasizes the differentiation of the three “classic” levels – base, main and attic. 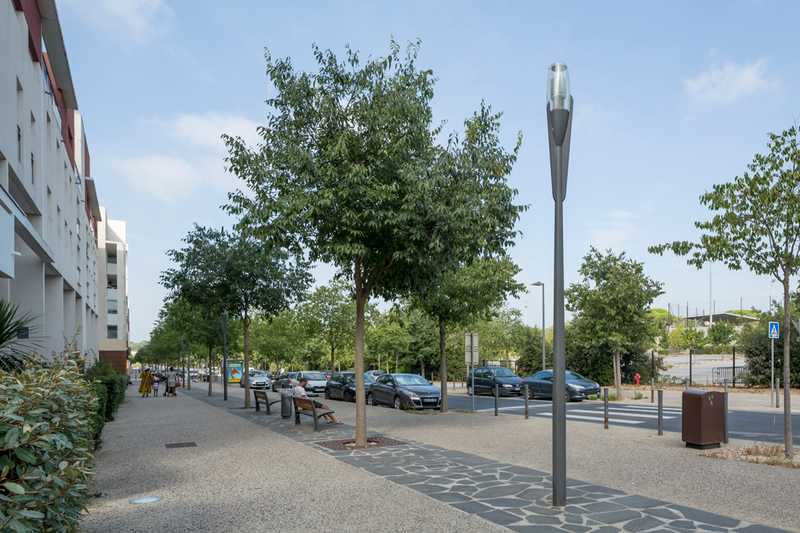 As a result, the streetscape displays a variety of features allowing a better legibility of the urban space. 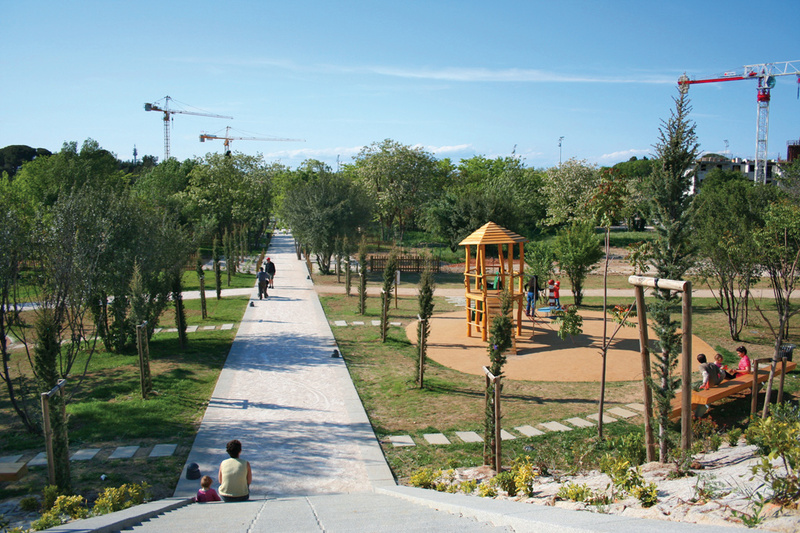 Ovalie is an environmentally friendly neighbourhood, with the “CERKAL – Habitat et Environnement”quality label. Every building project has to prove its sustainability, be environmentally friendly and implement efficient energy consumption practices (passive solar design, wooden door and window frame, rain water recycling, solar water heating system, production of electricity through solar panels, etc…), including collective equipment and services (wood and methanol urban heating, separate garbage collections for recycling, natural coatings....). This project is implemented as a “ZAC” and managed through a mission by the Architect Coordinator on the base of a specification chart.